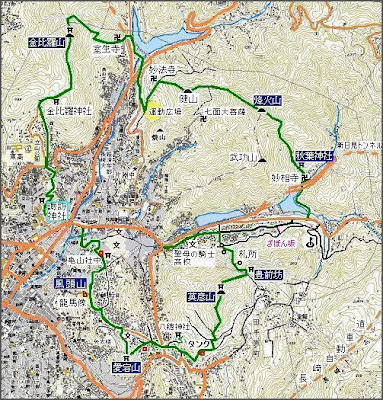 A pilgrimage in Nagasaki town, to seven mountains, during the time from January 2 to January 15. The seven mountains represent the seven most important shrines of Japan. Similar to the pilgrimage to the temples of the Seven Gods of Good Luck in Edo.
. even Gods of Good Luck 七福神 . The townspeople put on straw sandals (waraji) and walk to the seven "Mountains", temples and shrines around town. They combined it with visits to eateries and had a good time on the road, which sometimes lead through forests and small mountain trails. Check this link for more photos. The highest mountain on this trip was 400 meters, the whole tour took about 12 kilometers. shichigosan 七五三, the festival for children in November.
. Shichigosan (shichi go san 七五三) . White fish from the fish traps at Urakami yana 浦上簗（白魚簗）was a speciality. After visiting the Seven Mountains, the Nagasaki townsfolk would finally end up in Urakami to have a party. In Nagasaki, these fish were best when only 2 - 2.5 cm long. Whet it got warmer, they started to grow, so during the New Year holidays they were best. The small fish were put in a festive barrel (tsunodaru 角樽) coated with black laquer, so as not to damage their white skin when carrying them to the Nagasaki Magistrate (nagasaki bugyoo). They should have been offered to the Shogun in Edo, but that was simply impossible, so the Magistrate got them to taste. After that offering, fishing of the White Fish was forbidden until next year.
. Konpira san 金比羅山 .
. Shichimen san 七面山 .
. Akiba san 秋葉山 .
. Local Dishes from Nagasaki .